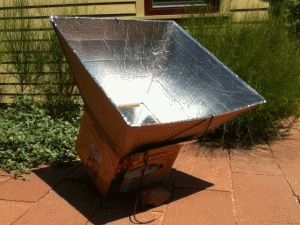 Deborah’s solar oven, made of cardboard, aluminum foil, and plexiglass reaches 350 degrees. The Newlands/Greenlands Low Carbon Group is focusing more on doing and less on discussing how to lower our carbon footprint. We made a list of things that make us happy such as… eating local food, gardening, riding bikes, walking in the neighborhood, using public transportation when we can, music and friends. We are planning monthly get-togethers around these low carbon activities. For our August gathering, some of us decided to build a solar project that could help us enjoy our local garden produce and extend the season. Deborah Yin built a solar oven and she plans to try baking fruit crisps and cookies while not having to turn on the inside oven and heat up the house. Larry and Kay’s, made of cardboard, clear plastic, wood, and window screen, is ready to dry their apple harvest. Larry and Kay Bingham like to dry their apples, excess tomatoes, and other local fruits and veggies for use beyond the season. 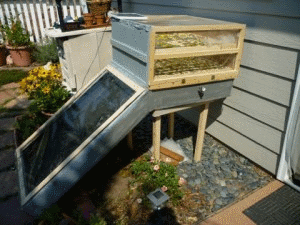 Larry built a solar dehydrator out of cardboard. We all met at the home of Vernita and Blake Cannon for a yummy potluck of local food and shared our projects. American University Radio | Is Local Better When It Comes To Our Food?